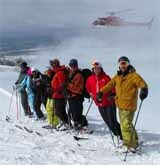 The folks from Vail go skiing in the Rubies. 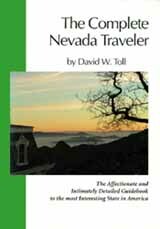 Get the New Complete NevadaTraveler at our Nevada Bookstore. 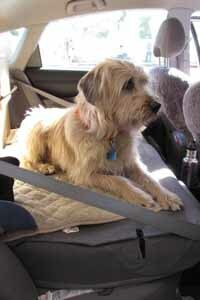 Our dog Shorty is a 35-lb terrier, yellow and shaggy with soulful eyes and a cheerful attitude that endears him to all. Shorty’s traveling suite is directly behind the pilot and navigator. This voyage through the sagebrush sea has no destination, just the pleasures of the journey itself and the people we meet along the way. We aimed the Contraption out of town early on a Thursday morning and made our way south on US 95 — Dayton to Yerington to Hawthorne to Tonopah. 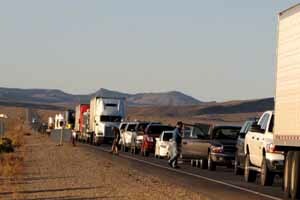 A considerable amount of highway work is being done on US 95. If this is stimulus spending I’m all for it; jobs are good, well-maintained highways are essential. I should mention that along with such attractions at the Mining Park, the Central Nevada Museum, the pioneer cemetery just north of the Clown Motel, there is also a bookstore of considerable size and scope just up the street. Towns larger than Tonopah don’t have bookstores as good as Whitney’s Bookshelf, and in its way it is as positive an addition to Main Street as the Mizpah. 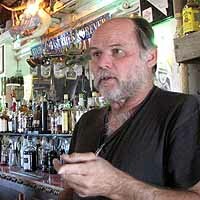 Sheriff Stone explains the house rule: you can’t buy drinks. He offered to host a barbecue for our group if we make our Excursion. 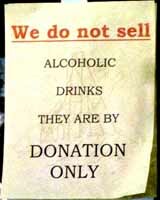 Now are you interested? Back on the road we made the Obligatory Candy Stop on the north side of Beatty, and slid into to the valet parking at Caesars Palace before dark. We don’t usually aspire to this level of elegance — my skin still crawls from recollection of a night years ago at the Blue Angel Motel — but this time we are Shorty’s guests and nothing is too good for us! As principal evaluator of accommodations and services offered to pets as they travel in Nevada, Shorty has been comped a room at Caesars. Robin and I are mere service humans, living large on his nickel. 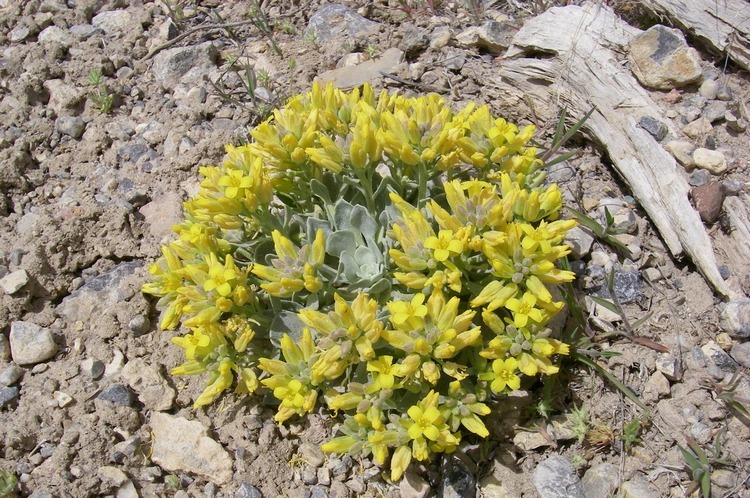 Just outside of Las Vegas within the Red Rock National Conservation Area sits a natural phenomenon staff and volunteers of Spring Mountain Ranch State Park have been investigating for some time. 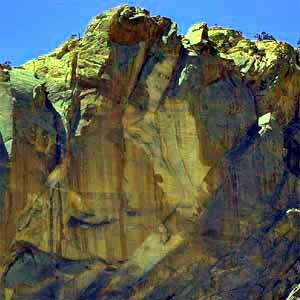 Sitting on Black Velvet peak, overlooking the park, is an image that some say resembles the Virgin Mary. But little is known about the figure that watches over the park. There are many stories associated with the image. 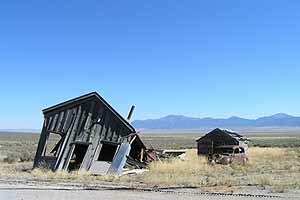 One of the stories relates back to the early history of Spring Mountain Ranch State Park. In 1865, Jim Wilson and George Anderson homesteaded the 360 acres that is now Spring Mountain Ranch State Park and created what later became known as the Sandstone Ranch. 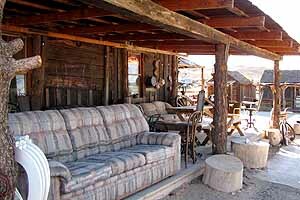 The Sandstone Ranch grew fruit and vegetables and raised cattle for sale to the mining camps in the area and the growing community called Las Vegas. George Anderson met a Paiute woman by the name of Kayer, but many Paiute women were called “Annie” in those days. Annie had one son named James, or “Jim Jr.,” with her previous husband Jim Beck (or Betts). George and Annie Anderson then had George Twison Anderson Wilson, aka “Tweed”. Little information exists on what happened to Annie or where she went. There are records that Tweed remembers his mom’s death when he was young. Some people believe the Black Velvet peak image is of Annie. They believe Annie protects and watches over Spring Mountain Ranch State Park because of the direction her face is directed. Since the phenomena was probably created by a large rock falling off of the cliff, which created the color difference seen today, it can also be considered as an acheropite, or simulacra, due to the spiritual nature of the natural phenomena. Shorty liked Caesars Palace. 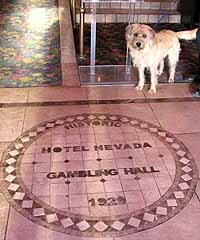 He liked Boulder City too, and he was ecstatic in Ely where he has been a welcome guest at the Hotel Nevada since he first joined us. Shorty is right at home at the Hotel Nevada in Ely. He trots in and out of the elevator by the front desk without even a glance up at the stuffed mountain lion poised to spring above the door. That lion is just one example of the cheerful whimsy that I find irresistable about this place. 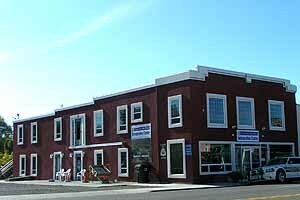 It turns out, though, that there are other places to stay in Ely, and that some of them also cater to traveling pets. 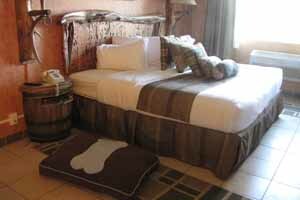 At the Prospector Hotel & Casino on the north edge of town an entire wing is now devoted to pets and their attendants, all the rooms furnished with your Best Friend firmly in mind. The Prospector caters to traveling pets, but their owners aren’t exactly afterthoughts. On our way north to Wells we spent a pleasant hour in Cherry Creek wandering the gritty streets and taking photographs. Cherry Creek might have been made out of parts from Silver City, Mina and Tuscarora, but the town it most reminded us of was the little burg in “Tremors” (one of the best Nevada movies of all time). We walked on tiptoes so as not to disturb the graboids underfoot. Cherry Creek provided an hour’s pleasant gawking. Speaking of Nevada movies, there was a crew filming in Virginia City a few weeks ago, making what might be as good a movie as “Tremors”. “The Motel Life”, a novel set in northern Nevada, mostly in Reno but ending in Elko, tells the story of two brothers struggling with the overwhelming material and spiritual poverty of modern American life. If the movie is as good as the book it will be a classic like “Ox Bow Incident” or “The Misfits”. 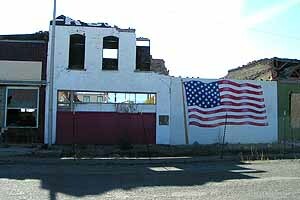 The old business street fronting the railroad is in ruins and must come down. owners whose structures were fractured by the quake could not agree on a plan for redevelopment, and the city announced the chain-link fence preventing access to the ruins would be removed. Now the historic row of structures, from the bowling alley on the east to the Bull Head Bar on the west, are being pulled down. Already there is a gap in the line, and before long only the bank building in the next block west will remain of the original Seventh Street storefronts. The good news in Wells is that the Trail of the 49ers Interpretive Center has moved to a new, larger site across Sixth Street from the old Chamber of Commerce building, and is being enlarged and improved in ways not possible previously. Wells’ other major attraction is the Ruby Mountain Brewing Co. Steve and Maggie Safford make some of the world’s best beer about nine miles south of town in Clover Valley. You take US 93 south, then turn west toward the towering mountains on the Clover Valley road, and turn in at the first ranch on the right — but call first to make sure Steve isn’t out haying or moving cattle: 775-752-BEER). While you’re there, ask for a taste of the Elevator Ale they unveiled at the Gallery Bar in Elko while we were there. All the descriptive words that come to mind (besides yum) are contradictory. It seems lighter and zestier than the ever-popular amber ale, but I think it will take a case or two to pin down the nuances. Dang. October 31 from 5-8 pm. The Governor and First Lady will distribute candy and be available for photos and there will be musical entertainment. For further information, call the Governor’s Office at 775-684-5670 . . .
Victorian elegance is the theme of the annual Governor’s Ball at Piper’s Opera House. And speaking of the Governor, the annual Governor’s Ball will be held Saturday, October 29 at Piper’s Opera House, B and Union Streets in Virginia City. Doors open at 6 pm, the ball commences at 7. This annual benefit for the Opera House features music by the Dennis Butterfield Victorian Orchestra. 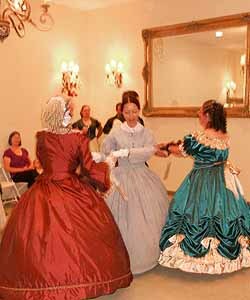 Dress in period attire (Civil War through the Edwardian era), and dance the original Victorian ball room waltzes and quadrilles with the help of Dancemaster Gus. Only 110 tickets will be sold at $20 each; call 775-847-7173 . . . Austin was the topic of an interesting article in the RGJ by the noted reporter-photographer Marilyn Newton . . . The Lake Tahoe Food and Wine Festival at Harrah’s and Harveys Lake Tahoe October 28-30 offers a magnificent array of superb food and wine, plus discussions, presentations and demonstrations by celebrated food and wine experts. They include Adam Richman, Chef Martin Yan, and Chef Michel Richard, French-born chef, restaurateur and creator of award-winning U.S. restaurants including Citrus, voted The Best Restaurant in the United States by Traveler’s magazine. Gustatory offerings range from a Epicurean Expo through a Whiskeys of the World tasting to a Champagne Jazz brunch, way too many delicious highlights to list here, but it’s all just a click away . . .
Advertising Walk of Fame, between 42nd and 50th streets in New York City, the advertising industry’s version of Hollywood and Vine. . . . In Minden cowboy poetry, lively music, tales of the trail and stretch-the-truth yarns are all part of the 24th Annual Rhymers Rodeer at the Carson Valley Inn Friday and Saturday, November 4-5. Dave Bourne, the piano player from the Gem Saloon on “Deadwood,” heads the program with cowboy poets Doris Daley, Ken Cook and Bob Christensen. The emcee is the laughable western humorist McAvoy Layne as Mark Twain . . . The Nevada Northern Railway in Ely — yes, yes, it’s actually East Ely, but let’s don’t quibble — has established an ambitious and innovative schedule of special trains and events through the year. 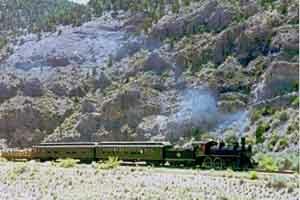 The Nevada Northern Railroad at full throttle. The Polar Express has been a local favorite for years, and the fireworks train for the midwinter Fire and Ice Festival proved a popular addition when it was added a few years ago. Now the schedule includes ainnovative variations on the theme, from BBQ trains to a Happy Friday steam train serving beer and wine, to a Saturday night ‘Rockin’ & Rollin’ Geology Train’, a Taste of Italy train, even a Plein Air Art Weekend. All aboard! . . . The Terrible Herbst gambling properties are now gathered under a new corporate identity, a new website and a shorter list of casinos as it has sold its two Pahrump properties and the casino in Searchlight . . . In Fallon the Churchill Arts Council presents Grammy-winning singer-songwriter Sharon Robinson, a long time collaborator with Leonard Cohen. Her songs link melodies from Soul to Jazz, and her sultry voice evokes hope, romance and sorrow all in the same breath. She performs on Saturday November 5 at the Oats Park Art Center ($20 for non-members, 775-423-1440 for details). Doors open at 7 pm, show starts at 8 and there will be a no-host bar . 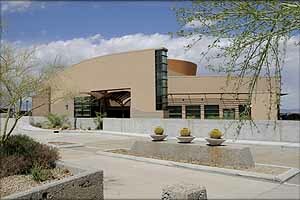 . .
Nevada State Museum, Las Vegas, at the Springs Preserve. Clark County website . . . 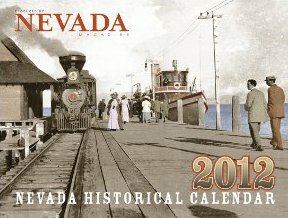 The 2012 Nevada Historical Calendar is now available. Nevada Magazine has produced this cool calendar for 40 years. For $12.99 plus $4 shipping and handling it makes a great holiday gift — and why not subscribe to the magazine while you’re at it? . . . Paleontologist Mark McMenamin took a look at the ichthyosaur remains at Berlin-Ichthyosaur State Park (click here for slide show) and thinks an even larger and more cunning sea monster preyed on them: a kraken, or giant octopus. He points out that differing degrees of etching on the bones suggested that the huge swimming dinosaurs were not all killed and buried at the same time, and it seemed as if the bones had been purposefully rearranged. “Modern octopus will do this,” McMenamin said. “I think that these things were captured by the kraken and taken to the midden where it would take them apart.” Evidence of the kraken attacks included many more broken ribs than would seem accidental, and the twisted necks of the ichthyosaurs. “It was either drowning them or breaking their necks,” McMenamin said with a shudder.